United Torah Judaism party chairman Yaakov Litzman skipped the weekly cabinet meeting in protest over the universal draft law. United Torah Judaism (UTJ) party chairman Yaakov Litzman skipped the weekly cabinet meeting on Sunday in protest over the universal draft law. A spokesman for the party said that Litzman, who serves as Deputy Minister of Health, indeed deliberately absented himself as an act of protest. However, there was no further comment about the matter. As part of the coalition agreement with UTJ, Prime Minister Binyamin Netanyahu agreed to allow Litzman to serve as “deputy minister” and left the minister's post empty. 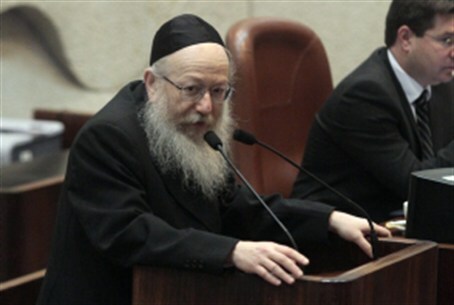 This allowed Litzman to avoid the appearance of becoming a minister in a State of Israel government, always avoided by the non-Zionist UTJ, while nevertheless endowing him with ministerial powers. Sunday's absence from the Cabinet meetng raises questions about a likely coalition crisis between Netanyahu and the hareidi religious parties. The impending battle is brewing over the issue of the universal draft, a demand by protesters who insist the government stop exempting fulltime yeshiva students and religious women from IDF service. Numerous secular Jews have found ways to avoid the draft, and Israeli Arab citizens are excused from service by law. IDF service is voluntary for Bedouin and Druze citizens, and currently there are limited voluntary programs in place for hareidi religious Jewish men as well. At its meeting on Sunday, the Likud faction unanimously approved the Plesner Committee report, intended to create an alternative to the Tal Law. Kadima MK Yochanan Plesner headed the committee that last week was dissolved by Netanyahu prior to issuing its recommendation that a universal draft include both Arabs and hareidi-religious Jews. The Tal Law, also called the “Deferral of Military Service for Yeshiva Students Law,” was originally passed in 2002, as a temporary law to be renewed every five years. It allowed a continuation of IDF exemptions for yeshiva students, who at the age of 22, can choose between one year of civil service with a paying job, or an abbreviated 16-month tour of duty, with future service in reserves, as an alternative to continued yeshiva life. This past February 21, the High Court of Justice ruled the Tal Law to be unconstitutional. Interior Minister and Shas party chairman Eli Yishai said he would “submit a Tal Law substitute” for second and third readings before the end of the Knesset summer session. Yishai vowed to oppose any form of sanctions against yeshiva students who choose not to be drafted.